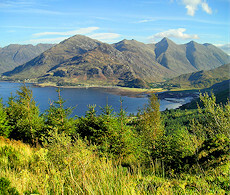 Kintail is a magical area full of impressive mountain ridges that rise steeply from shores and glens. 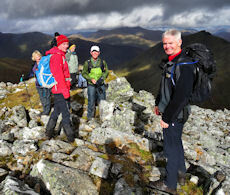 Crags, corries and cliffs, often hidden well from roadside view, tempt hillwalkers and climbers to the ridge summits. Over 2 days, we're here discovering Kintail's famed Five Sisters and their easterly neighbours, often referred to as the Brothers of Kintail. 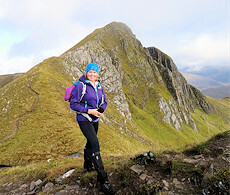 A 2 day event of guided hiking to high summits in Kintail in the Western Highlands with one of our experienced and qualified leaders. Starting from above 200m, faint paths lead to a remote area. Above, steep slopes gain rough mountain crests. We'll start the day from Cluanie Inn in Glen Shiel and head northwards on a grassy faint path into the heart of Kintail. Up to the col, the jagged outline of Ciste Dhubh towers above. Its slopes are grass covered and suprisingly quick to ascend. Returning to the col, our last major climb of the day presents itself - the slopes of Aonach Meadhoin, again predominantly grass covered. Beyond this, paths can be traced over Sgurr a'Bhealaich Dheirg and Saileag to a col, from where a steep descent returns us to the roadside. 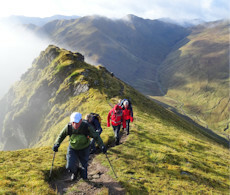 A hike up steep grass covered slopes leads to super ridge walking and stunning views. Our second day starts on a fine path, gently rising from Glen Shiel. It gets us quickly up onto the high ridge between Sgurr na Spainteach and our first Munro Sgurr na Ciste Dubh. 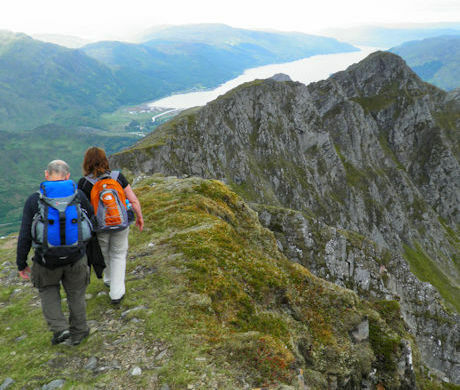 As we walk westwards from this summit, the views open up and become breathtaking, looking down the length of Loch Duich to Skye and beyond. 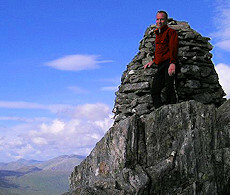 Over Sgurr na Carnach and up Sgurr Fhuaran, we'll sit by the cairn and enjoy the 360º panorama from this high point. We have a few options for our descent taking us back down to Glen Shiel or Morvich. The routes have faint paths lower down with grass covered slopes leading to mixed terrain higher up. The first day's hike is classed as 'demanding day' with the second day's shorter hike classed as 'moderate'. There is some boulderfield and rocky ground, but nothing difficult enough to be classed as 'rock-scrambling'. We are likely to encounter winter conditions on the 9-10 Mar'19 event and if this is the case, we ask that you come appropriately equiped. We can help with some of the necessary gear (eg ice-axe, crampons) and coach you in their use if needed. We'll be based in the Kintail area which has a reliable bus service running through from Glasgow, Fort Willam and Inverness to Skye (see the Citylink bus timetables for more info). We may be able to pick up from nearby accommodation if needed.